Evil is at its most insidious when it hides behind a veil of familiarity and innocence. There, wickedness is the most difficult to recognize and, more importantly, fight. We cannot bring ourselves to identify rot and decay in something we already know and love. Even when we do, we fear that the thing we love might not survive the necessary act of purification. So we must decide the result we want more—to destroy evil or to preserve what we love, because sometimes you cannot have both. The Demon’s Wet Nurse is an adventure for a group of novice characters who find themselves caught in a net of a cult’s plot to wreak havoc and, in so doing, loose a hideous demon into the world. During the adventure, the characters explore the community and deal with the locals to gather the clues they need to fi nd the source of the threat. The characters complete the adventure when they confront the unhinged cult leader and put a stop to her foul plan before it’s too late. 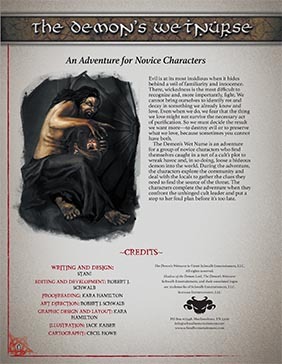 Buy The Demon’s Wet Nurse in PDF at Schwalb Entertainment or DriveThruRPG!